Poor poor poor Pierre Lapin. First, he was born with a French name, and then he was served up over a bowl of pappardelle. Perhaps, had he been named Pietro Coniglio he could have charmed his way out of his fate. Or as Peter Rabbit, he may have out smarted his captor. But no, such was not his luck. 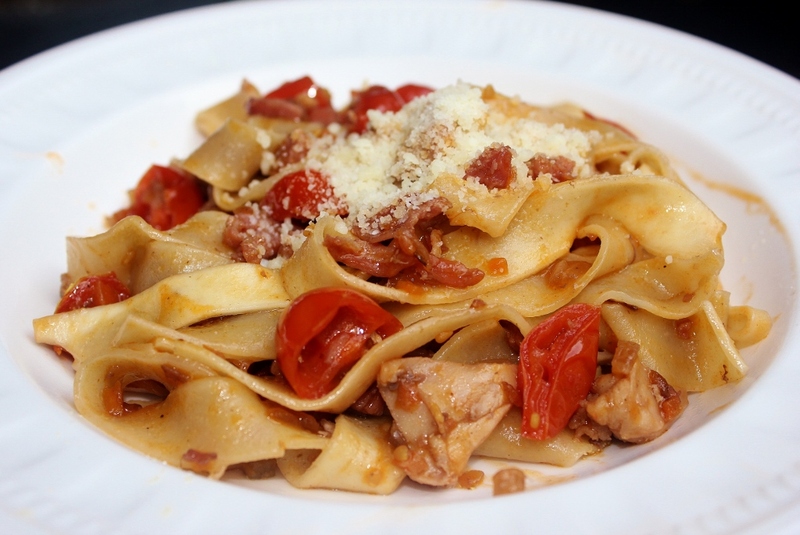 This week, we take a trip to Tuscany with Pappardelle al ragu di Coniglio. The first thing you need to do is find yourself a rabbit. And then you need to get over the fact that it looks like a rabbit when your cutting it into pieces. (Somehow, chicken no longer looks like chicken when it’s in a pan, but a rabbit still looks like a rabbit). Clean the rabbit and cut into large pieces. In a large skillet over medium heat, heat some olive oil. Add the garlic, then after a minute, add the rabbit and rosemary. Season with salt and pepper. Cook for 10-15 minutes, or until the meat is cooked through. Remove from the pan and allow to cool slightly. De-bone the rabbit and chop coarsely. Set aside. Add the onion, celery, carrot, and parsley to the skillet with the rabbit drippings and a drizzle more of olive oil. Cook over medium heat until golden brown. Add the prosciutto. After a minute or two, add back the rabbit and the wine. Cook for about 5 minutes, and then add the tomatoes and a cup of broth or water. Cover and cook for 10 minutes, adding a bit more liquid if it seems dry while cooking. Cook the pasta until al dente. Drain and add to the skillet with the rabbit mixture. Cook together for a minute. If you have time to make your own rabbit stock, you can simmer the rabbit bones in a quart of water with onion, carrots, and celery for an hour, and then strain.